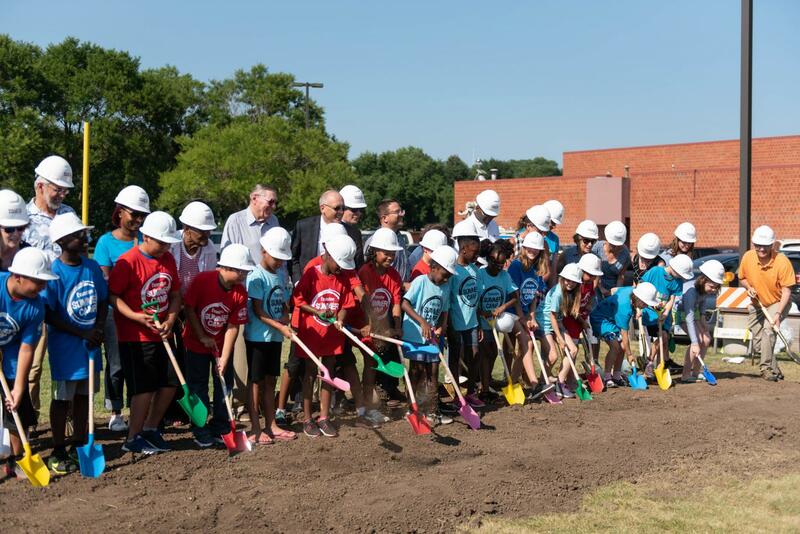 City officials and kids from Evanston Summer Camps shovel dirt at the Robert Crown Community Center groundbreaking ceremony. The complete renovation of the center is scheduled to finish in fall 2019. Evanston residents and city officials gathered Friday for a groundbreaking ceremony to mark the start of construction for the new Robert Crown Community Center. The ceremony, which was held on the fields of the Robert Crown Community Center, featured speeches from Evanston Mayor Steve Hagerty, parks, recreation and community service director Lawrence Hemingway and Ald. Donald Wilson (4th). Members from Friends of Robert Crown, a group dedicated to fundraising for the project, and kids from Evanston Summer Camps also participated in the ceremony. Hemingway, who served as the emcee for the event, said his department was looking forward to providing new recreational opportunities at the new center for both young and old residents. The new Robert Crown Community Center plans to have two full sheet ice rinks, turf fields, a daycare center and a branch of the Evanston Public Library. The project is estimated to cost a total of $53 million, with Friends of Robert Crown projected to contribute $15 million to the project. The new center is scheduled to open fall 2019. Daniel Stein, president of the Friends of Robert Crown group, spoke during the ceremony and said that the group has already raised $11.5 million of their $15 million goal. Stein said he’s confident the group will reach its goal. Hagerty added that the project is a “real community partnership” because of the collaboration between the city and the Friends of Robert Crown and the donors to the project. Wilson brought his own shovel to the groundbreaking ceremony because it is something he has used to “put a little mark” in the Evanston community, he said. He said he’s excited to see what the future holds for the community space.